Ray Bradbury, Mage of Wonders | Worldbuilding Rules! The 1970 Bantam cover of The Martian Chronicles. I still own the previous Bantam edition, which features the full cover painting by Dean Ellis (partially seen in the center of this cover). I no longer remember which was the first Bradbury story or collection I read, but I know that once I found his wizardry, I sought him out like an addict. I acquired an entire shelf of Bradbury paperbacks in just a few months, and read, reread, and wandered into the far, strange, familiar, lyrical and nightmarish worlds he created often with just a few thousand words. 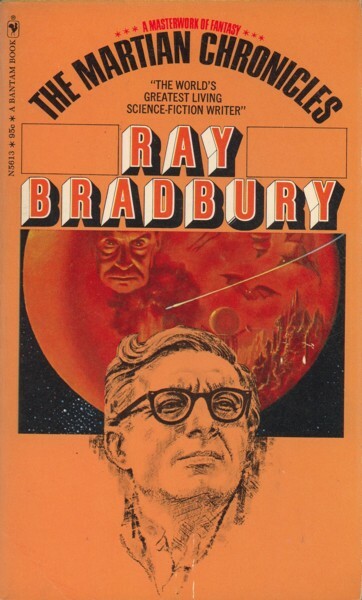 Bradbury, along with Tolkien and Star Trek, was my introduction to the concept that there existed an actual genre called Science Fiction* which contained all the kinds of stories I loved most. He and the others didn’t make me a speculative fiction reader and writer (I had been one since early childhood), but they showed me which road I was on, and that many others shared the road with me. And Bradbury, much more than the others, expanded my imagination into many directions that hadn’t occurred to me. He showed me the terrors lurking in mundane visions of the future, the gleaming horizons of a distant world, and that both horror and magic can be found anywhere in the everyday world. Another classic 1960s Bradbury cover from Bantam. When I find my copy, I’ll tell you who the cover artist was. A few years ago, I had the rare privilege of sitting in the same room with him for one precious hour at San Diego Comicon. I blogged about it here, in my farewell to Forry Ackerman, the man who, by encouraging his young friend Ray to write and publish, helped give Bradbury to the world and the future. And of course, dozens of obits have appeared in recent weeks. Here are my favorite farewells, along with what may be Ray Bradbury’s last published piece, an essay in the New Yorker, which appeared the week before his death. Thank you, Mr. Bradbury. May you live forever! *It was all called science fiction back then; none of the subgenre labels and distinctions that we argue about today had occurred to anyone. 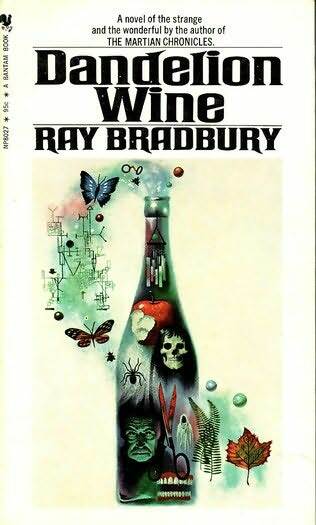 I, too, am searching for the cover artist for, “Dandelion Wine.” Did you ever find out who it is?? Very nice tribute, by the way – thank you!